A charity shave-off raises money to fight men’s cancers. Beards and beer go together like, well, hops and barley. Plenty of local brewers sport facial hair in some configuration, including MadTree’s crew. But on November 2, the whiskers come off. The Barbers vs. 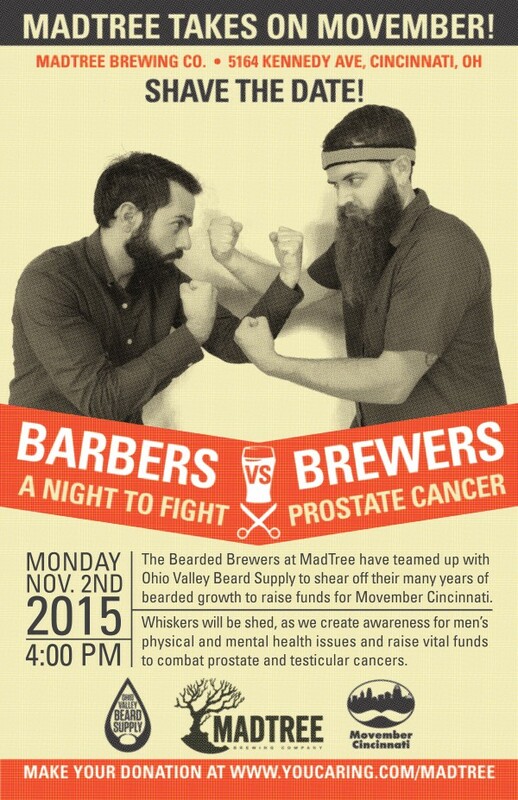 Brewers event brings Ohio Valley Beard Supply and Movember Cincinnati to MadTree’s taproom for a charity shave-off to raise funds to help fight prostate and testicular cancers. The more funds raised, the more brewers get shorn—you can pitch in at YouCaring.com/MadTree. Along with raffles, split-the-pot drawings, a DJ, and food from Catch-A-Fire Pizza Café, MadTree will tap a special Ohio Valley Beard Supply beer: Experimental Pale Ale 007. Infused with grapefruit, juniper berries, and cedar, it’s built to riff off of OVB’s Hemingway beard oil. UPDATE: As of 3 pm November 2, donations hit $5,000, guaranteeing you’ll see all of MadTree’s brewers fresh-faced and smiling this evening. Doors open at 4, with the main event at 6.